Declan Donnelly has done an excellent job of steering the Britain’s Got Talent ship solo, but unfortunately, he made a huge blunder when announcing this year’s winner. Newcastle comic ‘Lost Voice Guy’ – real name Lee Ridley – was a worthy winner of the competition, becoming the very first comedian to win it. However, Dec momentarily appeared to forget how the 37-year-old funnyman was unable to use his voice – hence his stage name – and had to speak through a tablet based synthesiser. After announcing the results during Sunday’s final, (June 3) the 42-year-old presenter held the microphone towards the champion’s mouth; despite him being unable to speak due to his cerebral palsy. Awww bless , what can you do in those situations where words slip out tho hey ? ?‍♀️ just gotta cross your fingers and hope they take it well ?? I have been blown away by the support of the judges and the general public. I’m very excited to perform in front of The Queen. I’ve loved her since she sang Bohemian Rhapsody. Lee was diagnosed with cerebral palsy at just six-months-old and subsequently lost the ability to speak. However, he hasn’t let this hold his back from expressing himself; working as a journalist before turning to comedy. Fans were quick to note the blunder, sympathising with Dec for his mistake. If you ever feel awkward, just remember Dec went to give Lost Voice Guy the mic. In my opinion, Dec was doing his job with Lost Voice Guy just as he would anyone else. And why shouldn’t he? Just because Lost Voice Guy doesn’t use his voice doesn’t mean he doesn’t require the mic towards him. In my opinion, Dec @antanddec was doing his job with #lostvoiceguy just as he would anyone else. And why shouldn't he? Just because #LostVoiceGuy doesnt use his voice doesnt mean he doesnt require the mic towards him. I didn't see the 'funny' point you were trying to make. So awkward watching Dec put the mic to “the lost voice guy” to give a winning speech, he Obvs can’t talk you fanny ??? Did Dec really just put the mic to the mouth of the lost voice guy.. 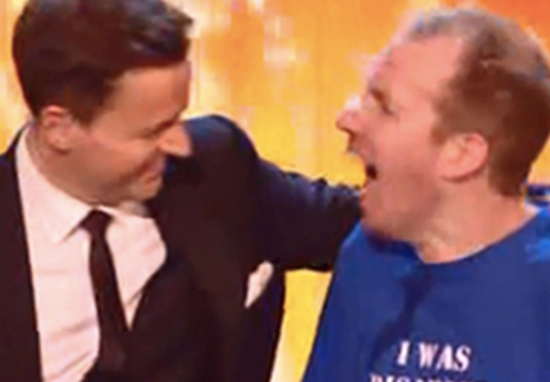 So Lost Voice Guy wins #BGT, and the first thing Dec does is ask him how he feels and stick a mic in his face ? Earlier this week, Lee suffered a bad fall in the hotel room where he was staying. Despite his accident and subsequent injuries, he was determined to compete in the final. This is why Lost Balance Guy never made it onto #BGT. Don’t worry though, it was only a trip. I’ll be match fit for the final on Sunday! His perseverance paid off, and he truly tickled the public’s funny bones in the live final; beating bookies’ favourite and fellow comedian, Robert White. Fans were delighted by his success, hailing him as an inspiration for those facing challenges in life. What Lost Voice Guy is able to do despite the loss of his voice is nothing short of incredible. That is talent right there. Lost voice guy stands for much more than comedy, he stands for all those people out there with a disability and showing the world no matter what life throws at you, you can still live your best life. Well done Lee! A worthy winner!